Millie is determined not to go to fat camp this summer; instead, she wants to go to a journalism camp. She is working at her uncle's gym to help him out when the gym is vandalized, and the culprit is required to work at the gym to pay for the damages. Callie never expected to get in trouble, but now she's had her entire life taken away from her - her phone, her freedom, even her afternoons as she has to work at the dumpy gym she and her friends trashed. Millie and Callie are thrust together and have to learn to navigate around each other. I really enjoyed this book. There are powerful messages in here about working toward getting what you want and dealing with the consequences of your choices. I really liked that Millie chose to befriend Callie and bring her into Millie's group of friends, even though Callie was pretty much the last person any of them would have chosen to befriend. 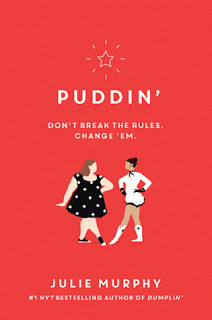 My only small complaint with this book is the lack of Dolly Parton drag queens like there were in Dumplin'. I received a complimentary copy of this book through Edelweiss for the purposes of review. Mitchell, Saundra. 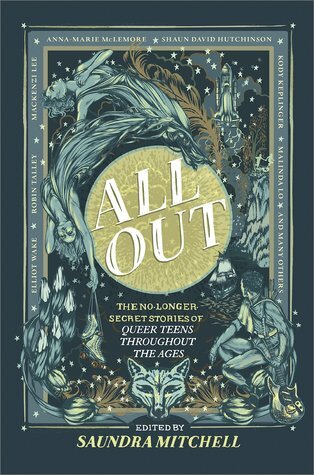 All Out: The No-Longer-Secret Stories of Queer Teens Throughout the Ages. Harlequin Teen, 2018. This is a compilation of short stories by well-known young adult authors. Each story features an LGBTQ+ character, though the stories vary in setting and genre. This is an excellent collection of stories. Strongly recommended. Mele, Dana. People Like Us. G.P. Putnam's Sons Books for the Young, 2018. Kay and her fellow classmates find another classmate floating in the nearby lake. Soon after, Kay receives a mysterious message directing her to a website which lists tasks she has to complete unless she wants her secrets revealed to the world. The web of lies and deceit spirals until Kay isn't sure what is real and what is just a fantasy. 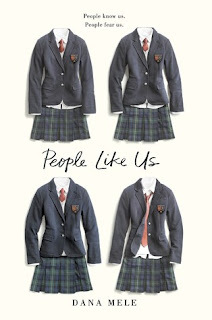 This book takes place at a boarding school and follows the typical "scholarship kid at a rich kid's school" storyline, except with a murder thrown in. I guessed at the ending way too early in this book, although I will admit that I continued to read simply to discover if I was correct. The suspense isn't that suspenseful nor the mystery that mysterious, and although I will agree that teens can be incredibly cruel to one another, this story is beyond standard suspension of disbelief. I do appreciate the queer representation in this book but wish that at least one of the queer characters would have had some redeeming qualities. Nevertheless, there are teens who would love this book, and for that reason alone it will likely be added to my library's collection.